A Wonderful, Simple Community Descended from the Most Desperate Pirates of the Old Caribbean Sea. The above headlines are taken from an article in the New York Times dated July 31st, 1898. 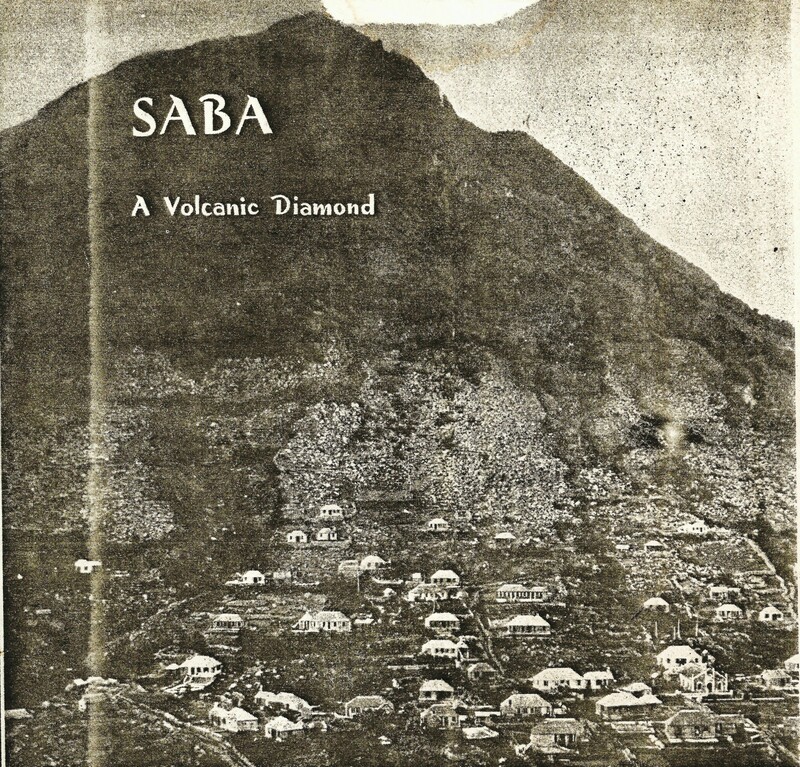 The person who wrote the article had actually visited Saba nineteen years before,in 1879. Because of the uniqueness of this story I want to present it to the readers of today and embellish it with a few old photos to suit. 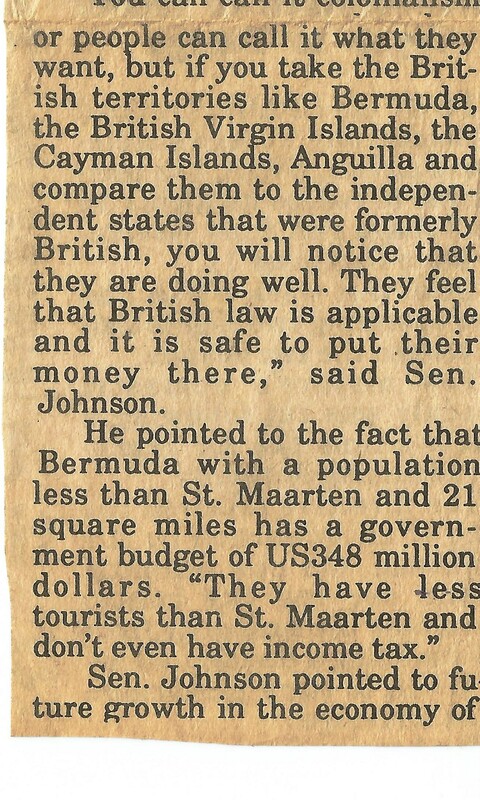 I had this posted in the nineteen seventies+ in my newspaper The Saba Herald. KINGSTON, Jamaica, July 19th.—With the exception of a few of the olden school of New England or “Down Easter” traders, and possibly a clerk or two in the State Department, there are not perhaps a dozen persons in the United States who could answer correctly the simple question, “How many republics are there in the West Indies?” Haiti and Santo Domingo are supposed to be the only independent Governments, and it will be something of a National surprise on a mild scale at this late date to learn that there is another –without of course, any flippant reference to the heroic Cuban Republic in support of which the United States is now generously pouring out its blood and treasure. Such, however, is the case. Besides France and Switzerland, Europe has her modest but ancient little republics of Andorra and San Marino, of which we seldom or never hear, and which the world is, therefore, prone to forget. And in like manner, besides the turbulent black and brown republic of Haiti the West Indies can (but do not ever) boast of a veritable little “Andorran” republic on the northern confines of the Caribbean Sea, which antedates the United States itself. For it dates its freedom, away back sometime in the twenties of the last century. A hundred years afterward it was described by the good Abbe Raynal in characteristically extravagant eulogy, as a very “temple of peace” whence its people looked forth from its towering heights between sky and sea on the turmoil of contending nations which went on around it. The subject of this sketch is but a tiny dot on the best of contemporary maps. It will be found north of the British island of St. Kitts, just a little past the Swedish island of St. Eustatia, named in tiny italics “Saba” and usually under the name is the legend “Dutch.” Nor does contemporary geography or literature throw any more light on its singular and interesting history and institutions. But it is in reality no more a Dutch colony than Andorra is a Spanish province, and, although it does fly the flag of Holland on Sundays and holidays, the design is modified by the patriotic addition of a green cabbage in the upper left corner – executed with very indifferent art. For the island of Saba, W.I. is an independent republic, albeit it is but a dozen miles in circumference, and its population numbers something less than 2.000 souls. But what the isle lacks in longitudinal extent it amply makes up in altitude, soaring, as it does, up into the very clouds to a maximum height of nearly 3,000 feet. And what its people lack in numbers they make up for in independence of spirit only comparable to that of the Swiss and Scots. A VIEW OF PART OF THE BOTTOM FROM AROUND 1895. The island rises with startling abruptness from the encircling sea, its general aspect leaving no palpable sign of its being inhabited. Indeed, the entire twelve miles of its coast is so sheer in its rise from the waves, rising to a considerable height of from 800 to 1200 feet before being broken by crag or slope, that no one would conceive it accessible to any foot but that of a sea bird. But on the south side there is a practicable break in the cliffs which gives access to a somewhat less sheer or utterly perpendicular face, along which a series of giddy stairs have been cut in the rock. 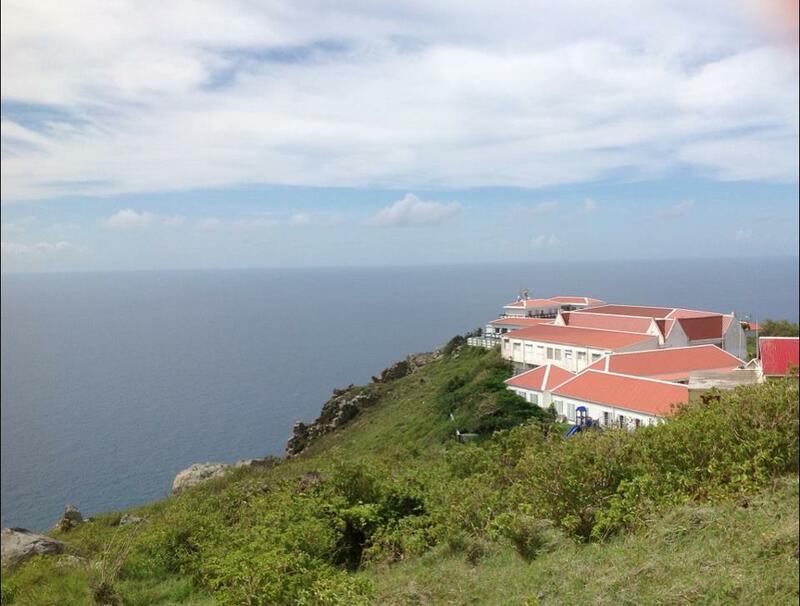 This is the port of Saba. The road aptly called the ‘ladder” consisting of nearly 1,000 steps of irregular height and breadth, and necessarily narrow, leads to a steeply sloping shelf, or gallery, that, in its turn, leads between perpendicular walls through the heart of the mountain to its summit. From this elevation, when one gets somewhat accustomed to the thin atmosphere and the giddy situation, a magnificent view is had of the surrounding islands – St. Eustatia, St. Martin, Anegada, St. Barts, Anguilla, St. Kitts, and Nevis, and, away to the westward, the blue caps of Virgin Gorda,s soaring peaks. And at one’s feet lies a lovely valley, or, more properly, a series of valleys, buried in the heart of this ocean mountain, which is now seen to be hollow, its towering ridges or serrated peaks inclosing like mighty ramparts as fair a tropical Eden as ever left the hands of the Creator. Coming as we do from the bosom of the deep, climbing stairs and causeways, such as would delight the heart of Rider Haggard, this view bursts upon us like some vision of enchantment. Yet it is all perfectly real. 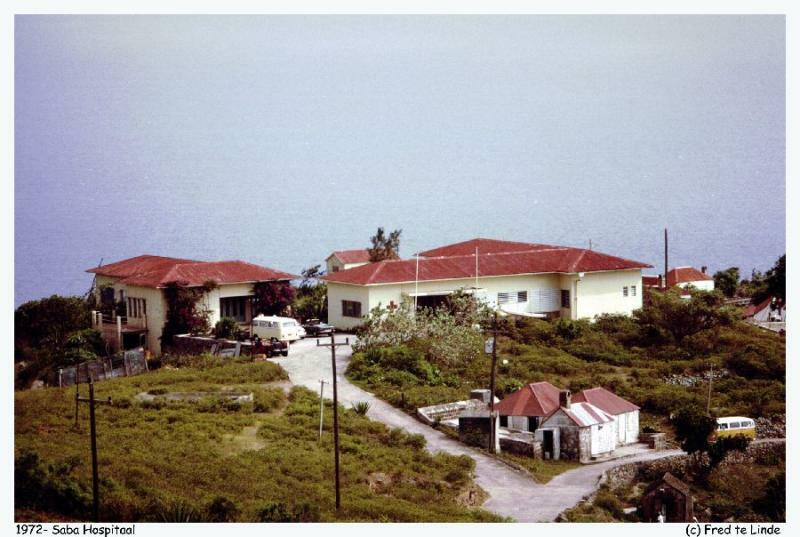 This was my first impression of Saba when I visited the little island republic some nineteen years ago, and to-day it is not to be doubted that it is little changed. It was then what it was in the grandiloquent old Abbe Raynal’s day, and in the nature of things it will continue so. For time treads lightly there. On account of intermarriages, the population is practically one vast family. Certainly they are “neighbours” in a sense not familiar to the world at large, for they live in a state of ideal communism. They are an agricultural and piscatorial folk, and, incredible as it may seem, are famous boat builders. 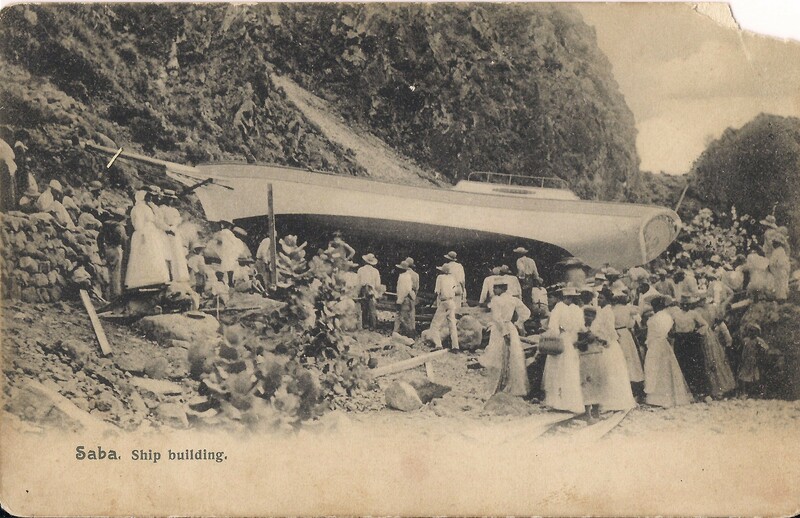 in former times even large schooners were built on Saba. They have a shipyard on the summit where they construct boats, and even sloops and schooners of considerable size, some as large as forty or fifty tons. These they slide down the sheer face of the southern cliffs, or lower by means of primitive but immense and effective derricks and tackling, and then tow them into the little cove where they are fitted out for sea. In these vessels they make voyages throughout the West Indies, trafficking in their island produce. Indeed, until the great American fruit companies and steam transit hut them out they even competed with the Bahama traders for the New York fruit and vegetable market. Schooners from Saba like the Esther Antia of Capt. Ben Hassell were trading with New York for over a hundred years. 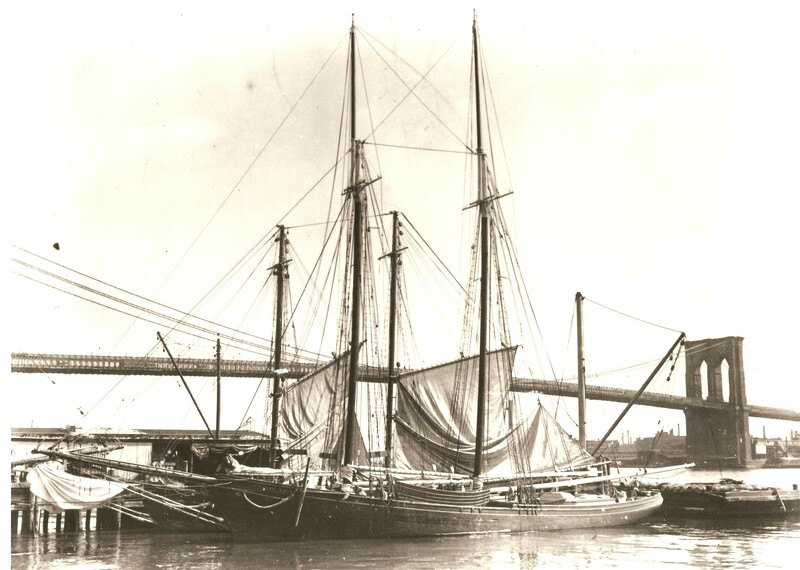 It was a normal thing back one hundred years ago to take a Saba schooner anywhere in the Northern Eastern Caribbean and head to New York. The principal products are cotton, which is manufactured on the island into slippers, hammocks, and other articles; and all tropical fruits and vegetables, especially cabbages which are regarded as par excellence the national staple. The cabbage is the coat of arms of the republic, and finds a place in its flag, as already mentioned. Every inch of the valley not occupied by habitations is well cultivated, making a lovely garden, the cultivation rising along the slopes of the mountain until the bare rock of the encircling crests is met. There are no streams, or even springs; but the rainy seasons are regular and the moisture is perpetual at that altitude. Moreover, nature aided partly by art, has made a peculiar arrangement for the water supply. The rainfall is immense, and ordinarily one good tropical storm would suffice to convert the valley into a vast lake. But the water courses of the interior slopes find a common outlet in an immense cavern that occupies a place in the northern side of the mountain. This cavern, in turn, has an outlet to the outer face of the island through which the water escapes when the cavern overflows. After an overflow the lower chamber retains enough water to supply the inhabitants from one season to another and possibly for a much longer period did the occasion arise. But the seasons have never been known to fail. The Sabans are all pure-blooded white people, without a stain of “colour” They are the descendants of a number of Dutch, Swedish, and Danish pirates of the seventeenth and early eighteenth centuries, who, discovering the little island and being at once impressed with its matchless possibilities as a stronghold, settled their families upon it and fortified its naturally inaccessible heights. In the course of time piracy fell off in that locality, and the island was abandoned by its masters. But the families remained, and they increased and multiplied in their aerial valley almost forgotten by the world that then made the West Indies the arena of naval warfare. Thus the Sabans grew up through a few generations of independence and had forgotten to owe allegiance to State or sovereign. Only in the present century they were to all intents and purposes “discovered” by the Europeans in the neighbouring colonies. They declined to be claimed and governed by strangers, however, and the problem arose how to subdue them. English, French, Swedish, Dutch, and Danish warships vainly strove to dislodge the islanders and plant their several flags, but the Sabans stood them off. Eventually the islanders surrendered to the Dutch Governor of the nearest colony, St. Martin, on conditions set forth by themselves. These conditions were that in consideration of Dutch protection they would fly the flag of Holland with the addition of a cabbage to distinguish their independence. They were to be exempted from all taxes and to appoint their own Governor, and pay him themselves. In fact, the Island’s affairs were to go on just as formerly. To this treaty the home Government consented. The affairs of the island are conducted by a Governor, who is appointed for life, assisted by a council of seven. Very like Andorra, Saba has no written laws, and there is little litigation and less crime to call for them. Possible disputes are settled by the Governor according to his judgment and conscience. Criminal charges could, without any doubt, be laid in the courts of St. Martin legally, but it is a doubt that the event has never settled whether the “free and independent” republic would recognize jurisdiction, and if not, one may well wonder how it could be enforced. As said, no taxes are paid by the Sabans, except their voluntary contributions in labour or in kind to maintain their own modest municipality. Andorra pays a customs tribute to France, and another to Spain, of 969 francs annually on its imports; but Saba pays nothing to Holland, if we except register licenses for the shipping and the price that is charged when a new flag is to be got. The Sabans are known throughout the West Indies for their exceedingly fair and indeed, ruddy complexions, blue eyes, and flaxen hair. All seem to be cast in the same mould, which is no doubt accountable to the incessant intermarriages above mentioned. Yet like all mountaineer tribes, they are a hardy and stalwart race, which characteristic is not modified by their marine habits. Mentally they are of a very high type, being exceedingly simple in thought as in manners, “the ordinary speculations of their minds seldom extend the confines of their sea girt citadel,” to once more quote Raynal. Their religion is Lutheran, and although they have no resident minister, their spiritual welfare is well looked after by the clergy of St. Martin. This is a copy of a photo taken from the Knickerbocker Magazine. The photo was taken before 1877 as the Anglican Church (built in 1877) is not in the photo. 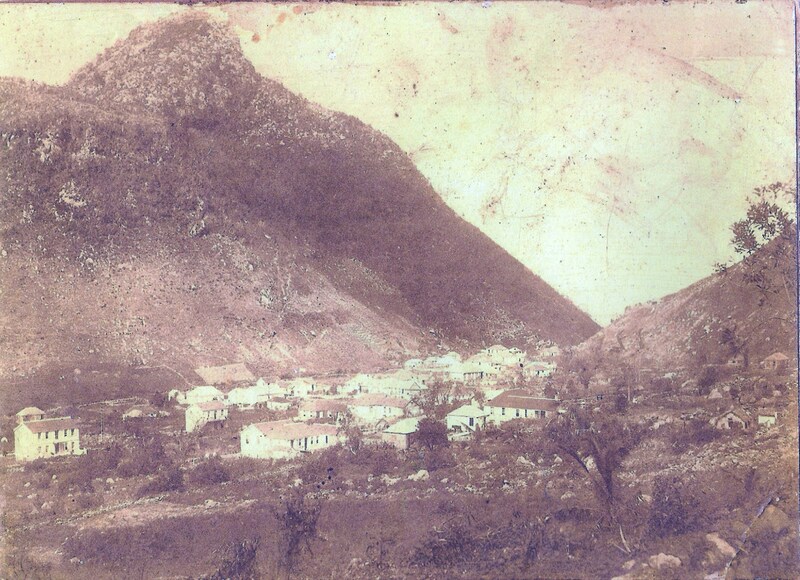 This is how the village of Windwardside and the Mountain would have looked like when the writer of the New York Times article visited Saba in 1879. Light gives hope for a new dawn. 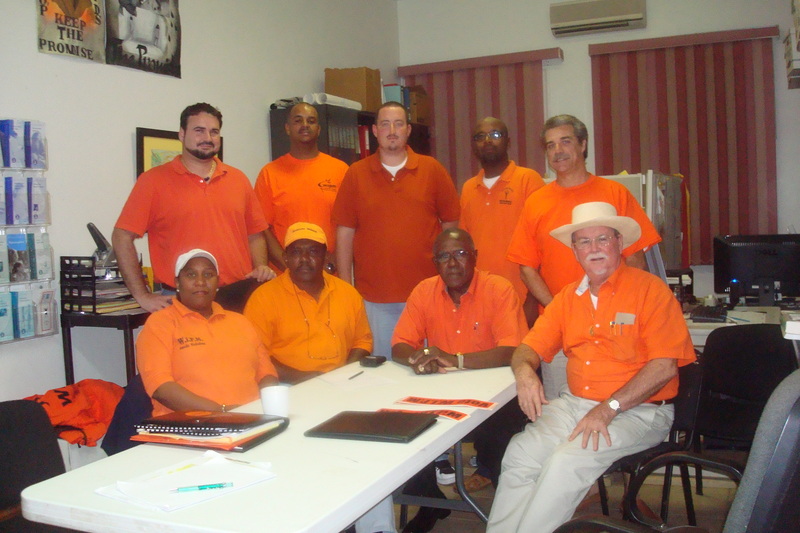 The WIPM continues to bring light and development for the people of Saba. Stability in government is what you as a voter needs and WIPM has proven that in the last years. VOTE WIPM. 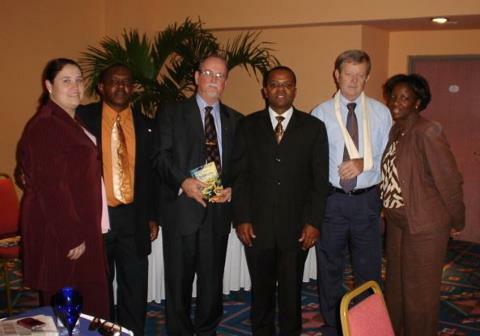 Always taking our responsibility as a political party seriously the party known as the WINDWARD ISLANDS PEOPLES MOVEMENT, a Christian Social Democratic Party, adjusts to the changing times. In an election period one of the first tasks is to reach out to people who are competent and willing to take the plunge into politics. I can tell you it is not an easy decision for one to take. I have been politically active all my life and I know. From 1998 when I became Act. Governor and then in 1999 taking over the responsibility as Commissioner as well, I went through hell to try and keep Saba from going adrift. People who don’t know better are telling you’ that they intend to fight the Dutch. Over what may I ask? I fought them more than anyone at the time. In the end it is their taxpayers money mostly which we are talking about. The solidarity fund was set up to replace the responsibility of the Netherlands Antilles when Aruba went on its own in 1986. Politics evolved over the years and the Havermans committee was set up to check on the finances of each island. I was so frustrated at the time having to deal with only around 3 million dollars a year with which to run the entire island. Havermans was a former Mayor of the city of The Hague. I took him to task in such an insulting way that after he left the meeting I could detect a look of despise for me in his eyes. I realized too late that I had gone too far. End result was that the small increase that Saba did get in the end was far below what we should have received and we had to go through endless suffering because of insufficient funds to run the island with. Two stable well educated Commissioners Bruce Zagers and Chris Johnson. Your guarantee for continued stability and progress on Saba is to vote for them and the WIPM party. We all know how the islands fell apart. There was only one way out. Seek full independence for Saba. Ask yourself, would you have voted for such an option? So why be so unreasonable in criticism of our young educated people who have kept the island going and with an enormous increase in funding for the island, for healthcare, education, the island budget you name it. Some people are so harsh in their unfounded criticism that I have to look at the logic of their thinking and the reasoning behind their complaints. Is it envy? Is it jealousy? Is it a love for Money, Money, and Money? With all of its flaws, being part of this Kingdom is far better and much more of an assurance for your investments on Saba, than being independent or part of many others countries I could name. If you watch the news you will see that we are living in an increasingly turbulent world, and it will get worse in the years ahead. The board of the WIPM party for elections in the past. Most of the faces seen here will be running on the slate of candidates for the WIPM party. We ask our WIPM followers to come out and show your support for the WIPM party in the coming weeks. If you look at the WIPM, the Orange party and give us a fair assessment, you will see that all of the members, who ran in 2007, ran again in 2011 and are running again in 2015. A sign of maturity you will have to admit. 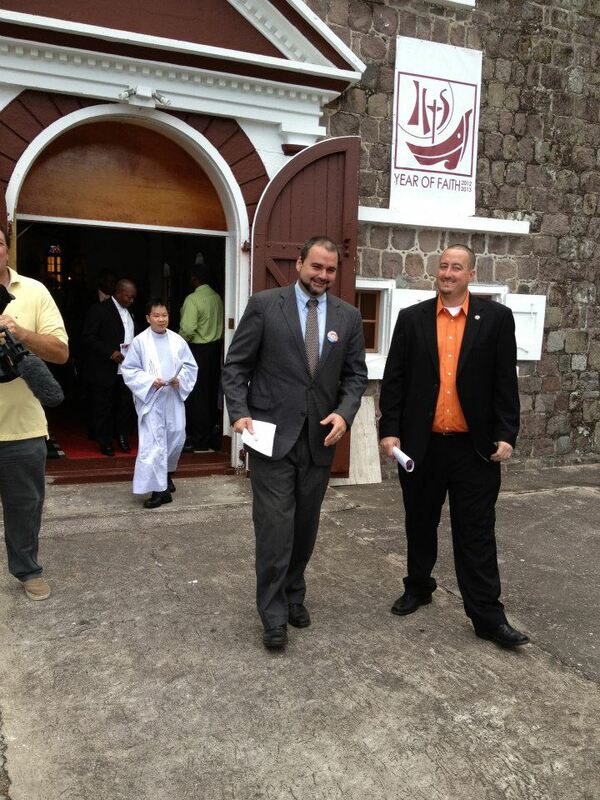 While the other islands have had several changes in government Saba has been a beacon of stability. Problems within the WIPM party have been settled internally despite all kinds of efforts to break up a team of hard working people. Saba has benefitted from this stability. Millions have been spent in infrastructural projects, the Island budget has a reserve fund and a balanced budget and with consternation the other islands look at the progress taking place on Saba while on their own islands there are talks of plans and projects approved, whereas on Saba our projects are being executed. Only a fool or a person who hates himself and others will try to tell you that nothing is being done. Try a change and then you will find out the difference to your own and your family’s regret. The adjustment from the old system to what we have now has been made more difficult by unreasonable people whose only objective is Money, money, money. They are the ones trying to mislead gullible and innocent people over a cliff into the land of despair. Once again the WIPM has gone to great efforts to present you with a team which can run the government of Saba and continue the path of progress as demonstrated over the years. The WIPM party has evolved over the years and once again we can proudly present you with a list of candidates from which you can choose. So if you want stability in government you will have to admit to your family and yourself that the WIPM has the best team to run a government. WIPM party leader once again. While he has been out there working and delivering others have been sitting back criticizing. Ask those who will be on the other party: ‘What have you done for your country lately?” VOTE ROLANDO WILSON VOTE WIPM The party with a proven track record. Those of you ,who have left your country and settled here, or who have invested in Saba whether it be in house or in a business we ask you to give our party a fair chance and vote for the WIPM once again. The finances of Saba’s government are monitored by the Dutch. The reason why Saba gets projects and added money to their budget is because of wise management of Dutch Funds allotted to Saba. Any change in local island policy to mess around with these funds will cause the Dutch finance ministry to clamp down hard on the Island and as a result many people could end up losing their jobs if the Government is forced to restructure. All we are asking you is to take a careful look at the two parties contending for the Island Council elections. Check on the ability of each party to run a government, check on the individuals and their track records and only then make your final decision. The WIPM party has started its campaign and you will be receiving more information on the party program and on the individual candidates running on the list of the ORANGE party. Take these elections seriously as it can have more effect on you and your investments on Saba than you think. We of the WIPM party have provided STABILITY IN GOVERNMENT and will continue to do so. Changes in the relations with Holland are being worked out by a Committee of experts and changes will come so keep on track with the WIPM and you will continue to live in peace and security in the years ahead. HAVE NO FEAR WIPM IS HERE. President of the WIPM Party. The WIPM torch continues to burn proudly. Reflect on where you were. Reflect on where Saba was and is now today. Look at all the positive which has been achieved. And look carefully at all those presenting themselves to be elected and vote in your own best interests. VOTE WIPM. 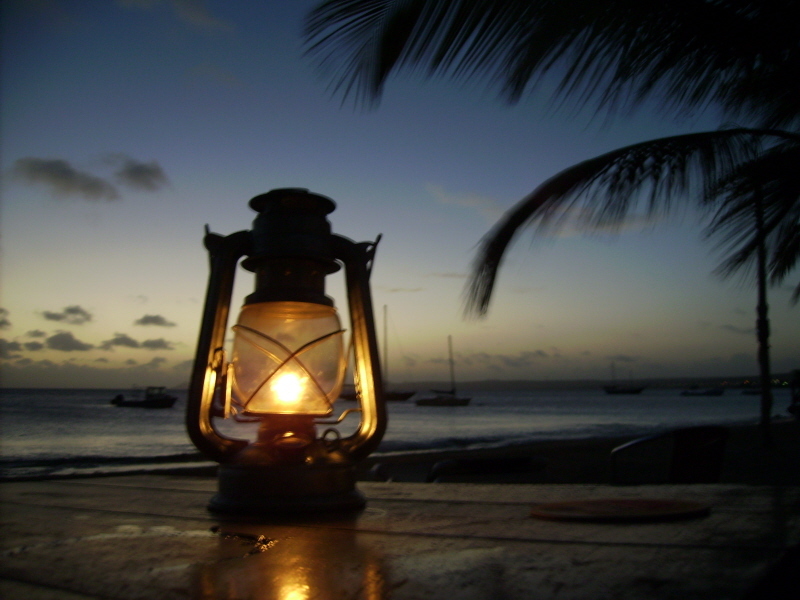 The old lamp lighter bringing you light on the issues so that you can make a decision when voting to safeguard your business interests and personal interest in the years ahead. The world will be going through turbulent times this year and the years ahead and you need qualified people to run your government. Vote WIPM. on the concept of a “Crown Dependency” status for Saba and St. Eustatius. 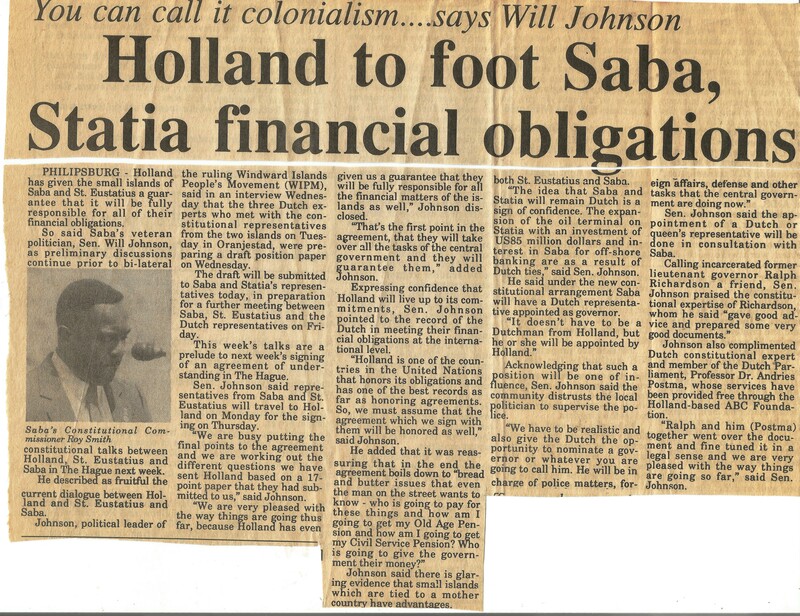 This article indicates what was agreed on by the then Executive Council of Saba, Commissioners Steve Hassell and Roy Smith and I as Senator in the Parliament of the Netherlands Antilles. Agreement reached with Minister Ernst Hirsch Ballin in The Hague in 1993. When we reached Holland the tide had changed. There was going to be a referendum on Curacao in a few days. The Hon. Minguel Pourier called and asked Mr. Ernest Hirsch Ballin to stop the process. 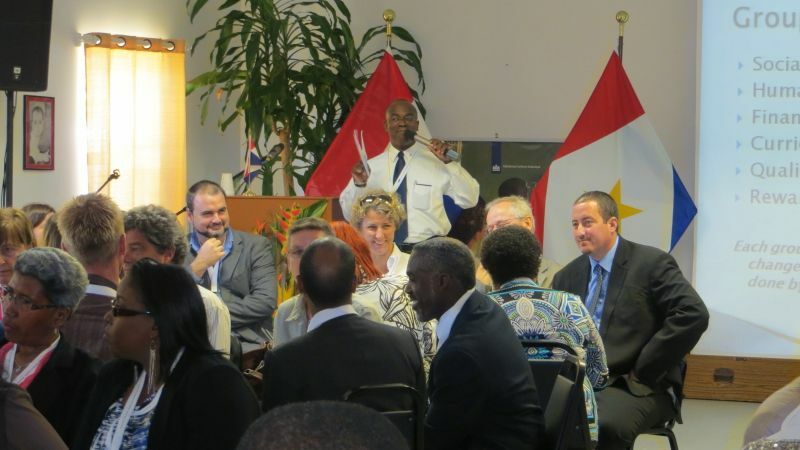 We told the Minister that this was a new political movement and he could not dictate for Saba and St. Eustatius. We insisted that the agreement be signed and it was done so reluctantly. The Curacao voters decided (in their own interest) to vote overwhelmingly to keep the Status Quo and the also voted Mr. Pourier into government the next year. At his parties insistence referendums were held on the other islands. The Executive Council and I met with social organizations etc. and we advised them to vote for the option to go with Holland as a Crown dependency. The people turned us back with arguments that for this reason and the other we should vote to keep the islands together. This was a strategic mistake on the part of the people who wanted to go that route. In the end we went along and supported in 1994 the option to keep the islands together. Continuation of the agreement reached with Minister Ernst Hirsch Ballin in 1993 in The Hague by Commissioners Steve Hassell and Roy Smith of the WIPM party. Things got worse and worse and the islands like Saba who had graduated to a black and white television were asked to even give up that. 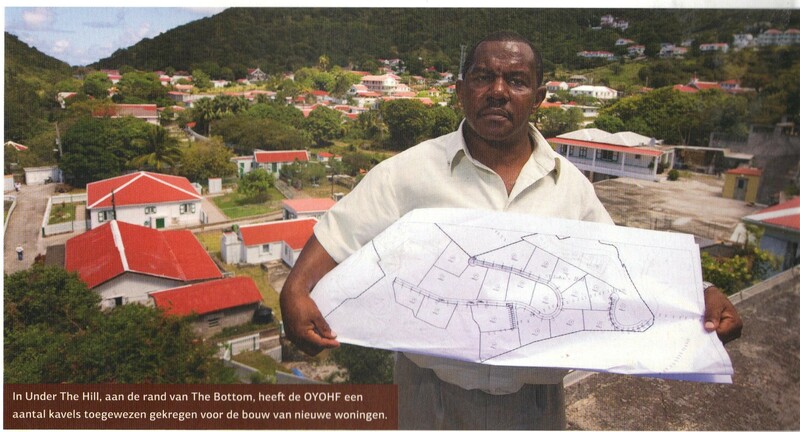 In the end things got so bad that the National debt of the Netherlands Antilles had climbed to $2.5 billion. Much of this was owed to the Government Civil Servant Pension Fund, the Old Age Pension Fund and so on. Then St. Maarten decided that they had enough and seemingly to the surprise of the politicians there the people voted for a separate status. Instead of they dealing with the Dutch they insisted that the other islands hold referendums as well. This took place in 2004. By then Statia had slipped the cable and decided against all the evidence that the other islands would vote to dissolve the country, Statia voted for the Antilles to remain the same as it was. The results of the referendum put an end to the agreement which had been reached in 1993. 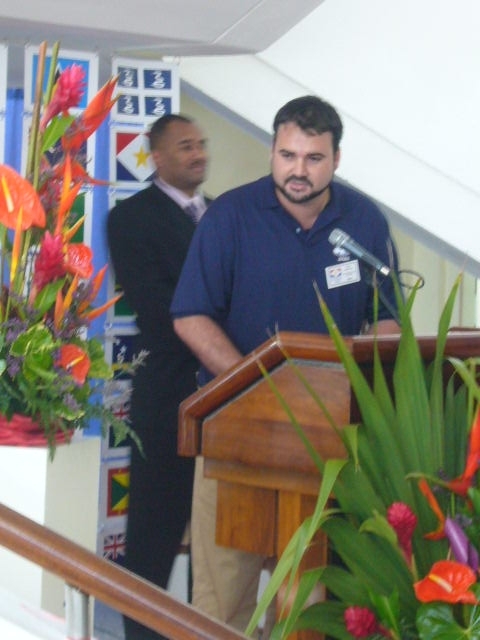 The same Steve Hassell who had left Saba to live in the United States, and who tried to topple the Government in 2003 which I was leading took part in all the discussions with the new status. Between 2003 and 2007 there were countless meetings with the other islands, the central government and The Netherlands about the payment of bills and the new constitutional status. Here as Commissioner of Constitutional Affairs I am presenting the then Prime Minister Etienne Ys with a copy of one of my books. This one entitled “Dreaming Big”. From Left to right: Commissioner Lisa Hassell, Roland Wilson, Island Council Member, P.P. Etienne Ys, Island Council Members Steve Hassell and Lucia Woods. Because Holland would not pay two and one half billion dollars just so the negotiations were much tougher. However it still was a financial windfall for the small islands as all our bills were paid, we now get medical care to Colombia and so on, our Saba budget has even a reserve fund and a surplus. The Dutch Government covers the costs of education, fire department and other services which formerly had to be paid from the Island Budget. Like the old lamp lighter the W.I.P.M. brought light and prosperity to the people of Saba. Those who have investments here. Those who came here from other countries, inform yourself well before putting your vote and the island and prosperity of Saba in danger by voting for the wrong people. We pledge to put out as much information as possible that you will know the candidates and their history before election day. No people can master their social and economic environment unless they understand the past of that environment. History not only educates, it liberates. Let us remind you that the W.I.P.M. party was the first political party in the Dutch Windward Islands to present the people of the three islands with a program of action. It is fitting therefore that we bring you the W.I.P.M. party program of 1971 so that you can see for yourself that the party vision of 1971 through the hard work and dedication of our party has come to pass. In a democratic society it is the right and the responsibility of all citizens to participate in all phases of life in that society. Where this right does not exist, or when the people shirk this responsibility, the word democracy becomes a farce. Politics is the moving force within society, and political leaders with vision can motivate society and cause social change. Everyone has the right to take part in the government (politics) of his or her country, directly or through freely chosen representatives. In these troubled times we feel that the political leadership of our country should rest in the hands of capable and responsible persons who are dedicated to the general welfare of all, and not mainly to their own personal gain and the enhancement of personal power. The people of Saba deserve a decent and progressive government. We appeal to you the people of Saba, in your own interest to study our program carefully, so that you may obtain an understanding of the goals, ideals and principles of this party. The W.I.P.M. will cooperate with any party or parties whose goal it is to work in the interest of the Antillean peoples in general and the people of Saba in particular, first, last and always. THE WILL OF THE PEOPLE SHALL BE THE BASIS OF OUR AUTHORITY. The inherent dignity of the individual, and respect for his equal and inalienable rights: we hold that freedom and justice are inseparable and that the social order should serve the welfare of the individual as well as the community. The rights of all citizens to participate actively in the government of his country. The position and rights of the workers must be regulated by law. The freedom necessary for fully, cultural, social, sport and recreational facilities which are indispensable for the development of a healthy and harmonious community. Everyone has the right to freedom of thought, conscience and religion, and is free to manifest his beliefs in private or in public. The representatives of the people should be men and women of character and INTEGRITY. All members are bound to adhere to the principles of this party. Commissioners Bruce Zagers and Chris Johnson have been carrying on the WIPM program and progress for the past eight years, supported by Island Council Members Rolly Wilson (Party Leader), Eviton Heyliger, Carl Buncamper and Amelia Nicholson-Linzey. A good team which have kept stability in government and Saba has benefitted much from this stable climate provide by these WIPM elected officials. Our party stands for a democratic form of government. In a democracy the chosen representatives derives his strength from the support of the people, and is therefore accountable to the people. All are equal before the law (Courts) and are entitled to the protection of the law. The rights of the individual are recognized and guaranteed. Justice shall form the basis for law and order. In the exercise of our rights and freedom we should respect the rights and freedom of others. In order to conduct the affairs of the people in a proper manner, the government needs and employs the help of civil servants. Much needs to be done to make this body function as it should. Government should make use of advisory committees, such as committees on agriculture, housing, price control, recreation etc. The WIPM party has represented Saba in international events such as the O.E.C.S. meetings. Good government requires people who can speak well and give the island the representation it needs and deserves. Our people are aware of who will be running for office and in the end will vote for continued good leaders. The economy should serve the community as a whole and not just the interest of a few. It is the responsibility of the Government to create an atmosphere which is attractive to investors, while at the same time protecting the rights of labor, as labour is the most vital part of the production process. Road to the old sulphur mines and other scenic and historical spots on the island. This was the former Princess Irene Hospital on St. John’s. The WIPM government as part of its party program decided to build a new Old Age Home and Hospital complex in The Bottom and to put the schools in this central location on the island. Plans for the extension are in the making and I have been appointed by the Courts to represent the landowners so that the construction can go ahead. The health and general welfare of all the people should be a continual concern to the people. The expected increase in population in the coming years will outstrip by far the growth of our health and welfare facilities. The skyrocketing cost of living makes life for the small salaried employee, the poor and the aged very difficult. A well organized plan for the disposal of garbage at the earliest possible date. Construction of government markets and slaughterhouses. Enacting a law regulating meat control. Construction of clinics in the various districts. Better policy in the granting of free medical care for the poor and the aged. Free dental care for the children and expectant mothers. Enactment of the institution of medical care for the school going children. Increase of the old-age pension with the possibility of adjustment to the rise of cost of living. Construction of sports and recreational facilities. This is the Centre Piece of a number of sports facilities which have been provided over the years by the W.I.P.M. government. Enjoyed by one and all today. 10.Stimulation of cultural activities by local talent. The WIPM party brought in expert agriculturist who gave training to locals, we built the agricultural centre and had quite a bit of export of local produce to the neighbouring islands. 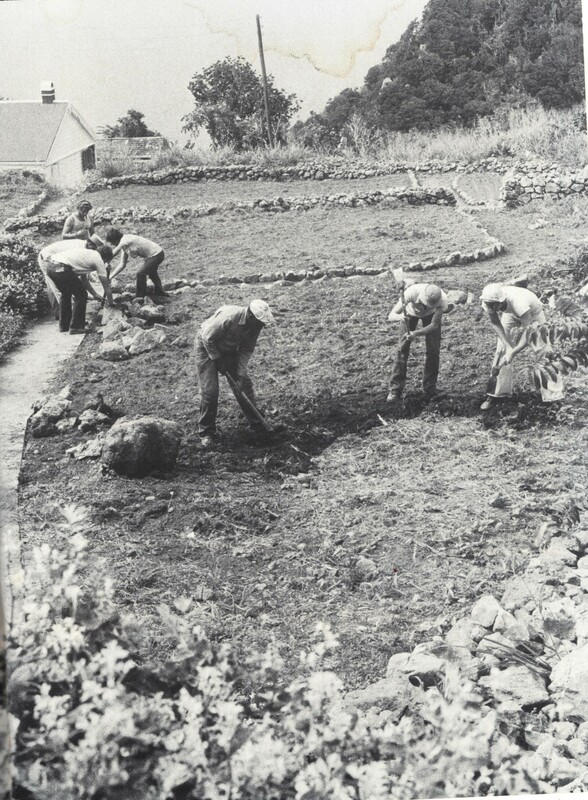 Here picture is Mr. Johan Hop with a group of locals setting up an experimental agricultural station at the Museum and also on Booby Hill. Locals were given every encouragement to continue our age old agricultural practices. 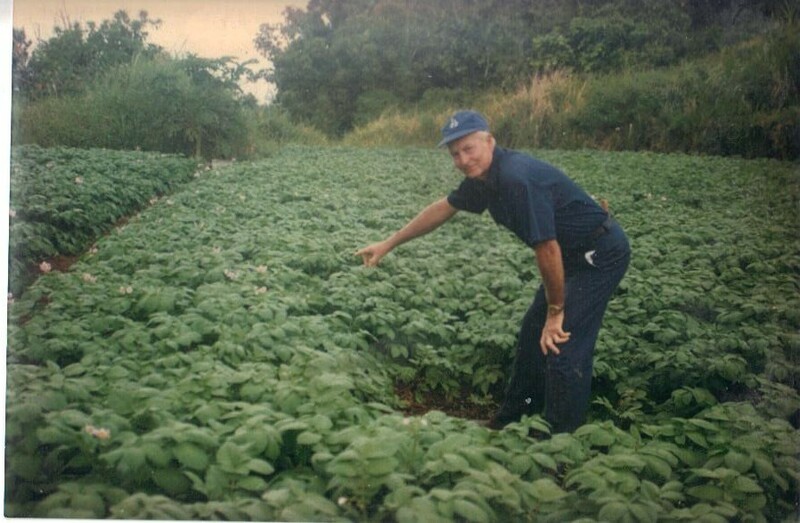 Here is the late Bernard Johnson demonstrating his Irish potato patch on The Level. There is a belief, which we do not share, that farming and stockbreeding are no longer possible on Saba. The reason most often given is that it does not rain as much as in the good old days. This can only be proven if the average rainfall over the years was to be compared. If records were kept this should be quite easy. We feel that such a comparison would prove this belief wrong; rain follows a certain cycle so that we get a number of relatively dry years followed by a period of rainy years. Granting advice and assistance to farmers in order to obtain top quality livestock. having a general pest control and the continuation to rid the island of rats, slugs etc. Building roads to areas mostly used for farming so that farmers can transport their products easier. Building and fixing water reservoirs, so there will be an abundant supply of fresh water in times of drought. 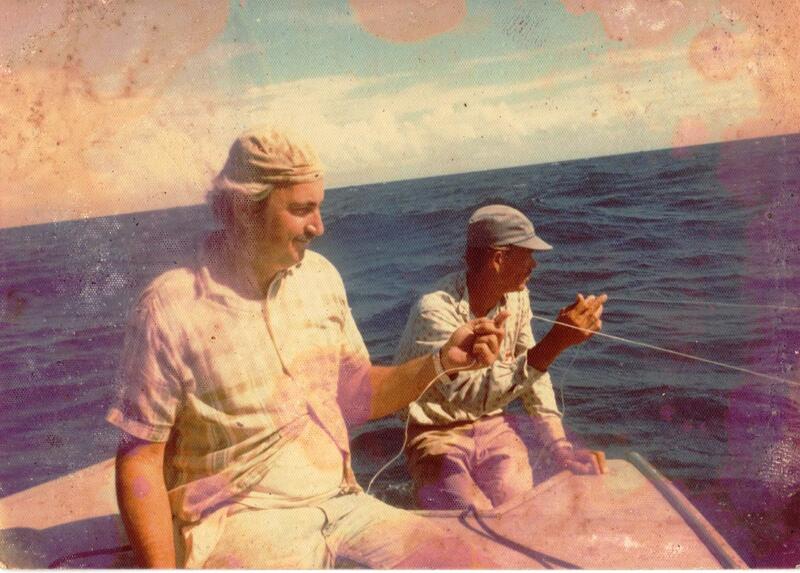 Here pictured is Guy and his cousin Howard Johnson fishing in the traditional way on the Saba Bank. 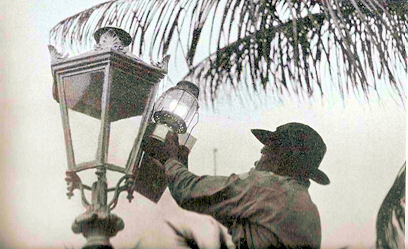 The WIPM had the law arranged to protect the Saba Bank by the Coast Guard. Before that there were fishing fleets coming from the surrounding countries and fishing the Saba Bank dry. Fish is one of the oldest foods known to man; man fished before he kept animals or farmed. Fish later lost its great importance as food for the vast majority of mankind, but today as the exploding world population threatens the world with mass starvation in many areas; man is once more turning to the sea and rivers as a valuable and relatively cheap source of food. Fish is not only tasty, but has a high food value. Food elements in fish are protein, fat, vitamins and minerals (e.g. iron, magnesium, copper, calcium etc.). Yet this valuable source of food, which also can be made an economical asset, like farming and stockbreeding has been totally neglected by government so far. At the moment Saba produces little in the line of food, almost all foods are imported. The WIPM party took over the government of Saba in 1971 and in November 1972 history was mad with the inauguration of the Capt. 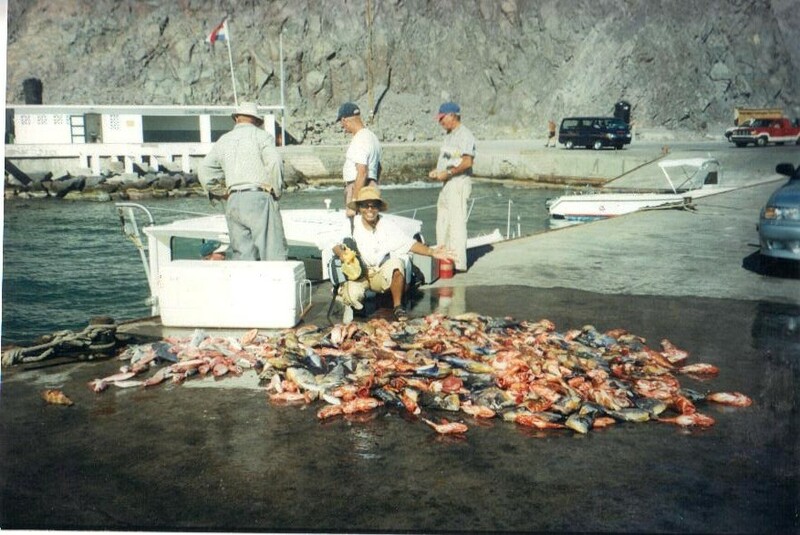 Leo Chance pier, pictured here with Bernard Johnson and others coming in from the Saba Bank with a nice catch of fish!! This poses a great danger to the people of Saba, besides being very expensive; a prolonged shipping strike in the USA would gravely affect the food situation in Saba and even the economy of the island, since the tourists do not come here to starve. And in the case of war, with Saba being at the present time dependent on the outside world for almost all its food purposes, people would most surely starve. either send our local boys to Holland on scholarships to study modern methods of fishing or requesting experts from Holland or the U.N. to come to Saba to teach them. Requesting financial assistance from Holland to purchase boats and sophisticated equipment in order to fish easier and with better results than at present. Demand protection by requesting the Federal Government to nationalize the Saba Bank, or extend the territorial waters of the Netherlands Antilles. (On my watch, after I was elected as Senator in 1985, I was able to get the Saba Bank set up under the supervision of the Coast Guard, and to extend the territorial waters). Where and whenever possible granting loans to local fishermen by the Island Government with which to purchase equipment etc. This is only part of the school complex on St. John’s which the WIPM government built to replace the hospital and to centralize the schools in one location. The WIPM party has a vision for Saba and much has been accomplished already. Thanks to this school we have a number of Sabans who passed through this school who went on to achieve University diploma’s. Now you the voters are being asked to sacrifice your children on the altar of ignorance by some who are pretending that you don’t need an education to run a government. Believe that and put yourself back in the stone age. Education is one of the most important areas of the government responsibility (both public and private). This is even more important in a developing country, for education is the key to progress. Everyone, regardless of race, creed or social or economical status has a right to education. 2. All education should be free, from kindergarten through high school. 3. Elementary education should be made compulsory. (That too was achieved during my term as Senator). Technical and professional training should be generally available and higher education should be equally accessible on a basis of merit. Education should be directed to the full development of the human personality and to the strengthening of respect for human rights and fundamental freedom: understanding, tolerance and friendship among peoples and nations being promoted. Parents should have a voice in the education of their children. As with all other sections of government responsibility, planning is an urgent necessity. Mores scholarships should be granted to deserving pupils. An independent scholarship committee should be created, so that scholarships can be granted solely on a basis of merit. More of our young people should be encouraged to study teaching and more scholarships should be given for this particular study. Our object therefore is not just to attain political power, but to introduce new standards of conduct into politics; to place the welfare of the total community above our own personal welfare, and the welfare of a chosen few. We intend to use the power entrusted to us by the people in a just manner. We do not believe that order, respect for authority and peace in our community can be achieved or maintained indefinitely through a blatant of and an indiscriminate use of force. Peace is more than just THE ABSENCE OF WAR; the existence of order lies on a higher plane than the enforcement of order. We seek to create an order based on Justice. We reject extremism not just the extremism, of the poor and underprivileged, but also of the rich and the powerful. We recognize that when an immovable object meets an irresistible force, something has got to give. The extremism of the poor, labor and youth is but a reaction to the centuries old extremism of the rich, the educated, the political perverts, to their indifference, and lack of sensitivity, and to their blatant exploitation and disdain of the vast number of their less fortunate fellowmen’ to their me-first-attitude, and to their elevation of PROFIT as man’s primary motive. 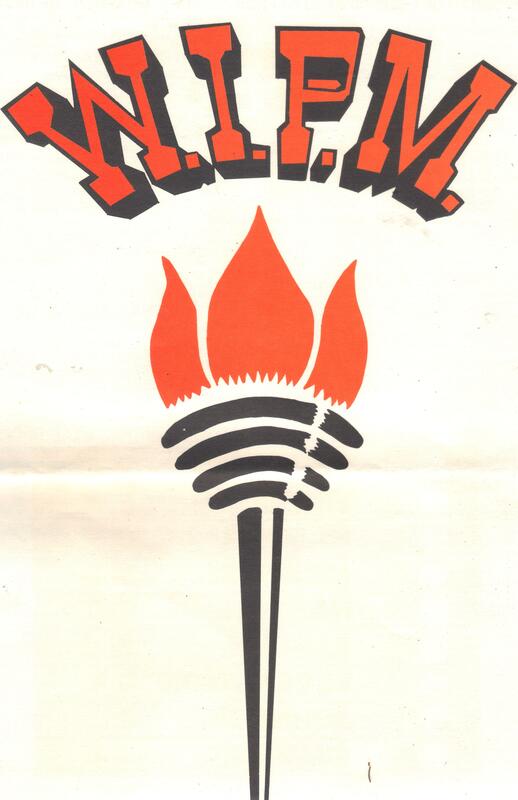 The WIPM party when it was established in 1971 promised to bring light to the people of Saba and we brought light, prosperity to our people. We have no regret for doing this and most if not all of our people have benefited by this. We ask you to continue the trust in our WIPM party and on March 18th, vote for your investments on Saba, vote for continued progress and for the future of your children. VOTE WIPM. The eminent French Philosopher Jean Jacques Rousseau wrote long ago: No citizen should be so rich as to be able to buy another man, nor should any man be so poor as to be forced to sell himself.” We therefore appeal to all citizens of our community to join us in creating a JUST society, for: WE ARE INDEED OUR BROTHER’s KEEPER.